Along with too many holiday meals, I gave myself a break from running or biking the past few weeks, so I’ve watched sadly as the cookies and other goodies have happily settled on my hips and abdomen. My excuse for the exercise break – most days its been too cold outside and my treadmill and I don’t have the best relationship (maybe we need counseling) On a few mild days I walked outside and a few times I walked at the mall, but I’m ready to do more. We’ve passed winter solstice and the days are getting longer and warmer – right? Please indulge my wishful thinking and say yes! I only have one body and I want it to be healthy, so it’s time to get back to regular running. The winter running clothes have come out of storage and the treadmill dusted off. I’ll vary my runs between the two based on the weather and my schedule and my mood. Last January, a friend Linda and I started a running club, that we named Running, Because I Can! The weekly club runs were great (most of the time) Running with others and the accountability of a slightly longer run each week was excellent motivation. The laughing (thanks all, but especially Betty!) after the runs, as we stretched and did strength training, was priceless. 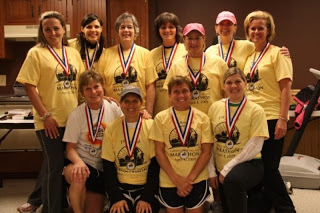 We had five relay teams from the club in the 1st annual Garden Spot Village Marathon in April. (pictured are some of the relay participants) I even had 15 minutes of fame with an interview by the local TV station. We took a break from the club in November and December. Now its time to revive the club – beginning January 5th. If you live local, you’re a woman (sorry guys, but you run faster than us and that’s depressing) and you’re interested in running – we’d love to have you join us! We will have two weekly club runs – Tuesday night at 7 PM and Saturday morning at 10AM. We’ll start out slow – doing a half mile to a mile the first week and add a little distance each week. Everyone runs at their own pace – some walk more than run, some jog slow (that would be me) some jog fast, and some RUN. If interested, I’m sure you’ll find a pace that works for you. More info on our Facebook Group Page. A healthier body is on the way! I’m ready, excited and looking forward to the 2nd Garden Spot Village Marathon on April 10th. Last year I did the 4.6-mile section of the relay, this year I hope to do the 6-mile section – one step at a time, I’ll get there. I’m feeling ambitions right now, so I’m dreaming of a half-marathon later this year – maybe the Rock ‘n’ Roll Virginia Beach Half Marathon on Sept 5th. What are you doing for your health in 2010? sounds like an ambitious undertaking! Good for you! I'm way too unmotivated about my health. I'm an on-off gym guy. Can't seem to ever get to a plan that I can stick with. So I guess I'll be repeating the same resolution I've had for years – get buff. Too bad you're not just a little closer. I'd join you! So I'll have to do it on my own and just pretend. Isn't it crazy how fast our bodies react when we stop running?! How crazy is that? It'll take me twice as long to build the muscle and endurance back up as it took for it to waste away!